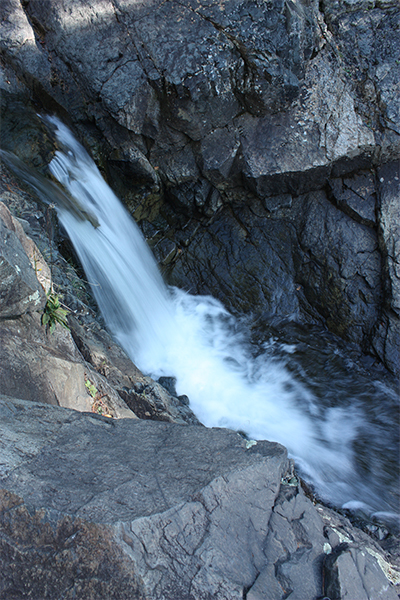 Share this page / follow New England Waterfalls on Facebook! Unless it was at least 85 degrees out, I wouldn't dare swim in a swimming hole this far north. Maybe you are braver than us and will enjoy the nice small pools you can find here. The waterfall and shallow gorge here are geologically interesting, with chutes and slides all over. The brook drops a total of 15 feet over a span of 75 feet or so, with no individual waterfall or cascade being really noteworthy. Most visitors are likely staying at the nearby South Branch Pond campground. 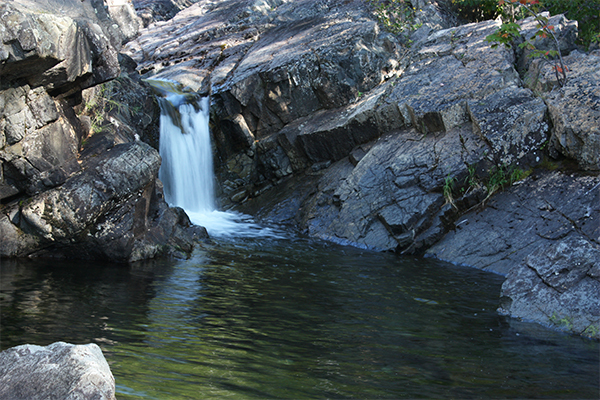 If you are staying at the campground, or you are already in the northern Baxter region, this waterfall is probably worth a look. We would not recommend going out of your way to view this one though; there are several other better waterfalls to see in Baxter State Park. Also, take note that no dogs are allowed in the park. In fact, you are not even allowed to transport them through the park. A blue-blazed trail starts at the parking area and leads gently downhill about 0.45 mile to a junction very close to the river. If you bear right, you will soon walk across a 100-foot section of ledge. 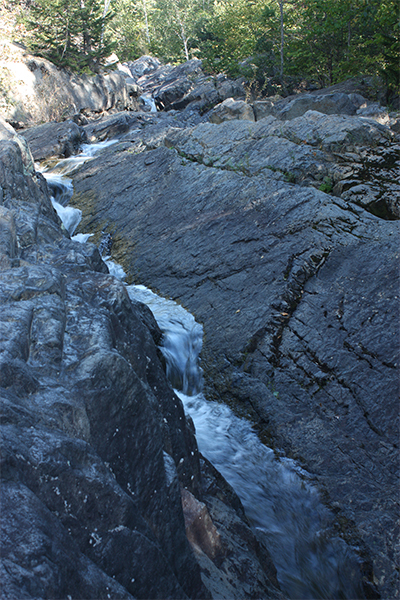 The falls are just downstream of the edge of these ledges. The best approach is to continue about 75 feet further downstream after crossing these ledges. At this point, you will have reached the river. From here, you must then backtrack 50 feet upstream to the falls while staying close to the river. From Bangor, take I-95 north to exit 264 in Sherman. Take ME 11 north into the town of Patten and take a left onto ME 159 west (often marked as Shin Pond Rd). Follow ME 159 west all the way until its terminus at Shin Pond, where the road continues on as Grand Lake Rd. Follow Grand Lake Rd until you reach the northern entrance of Baxter State Park at Matagamon Gate. Stop at the gate to pay the fee ($13 in 2009 for out-of-state residents; free for Maine residents) and provide your itinerary to the ranger on duty. From the ranger gate, drive 7.0 miles along the park road (called the Park Tote Rd) and take a left onto the road leading to the South Branch Pond Campground. Follow the campground road for 1.2 miles and there will be a marked parking area for the falls on the right with room for two or three cars. If the lot is full, you are out of luck as there is no parking allowed on the road itself. 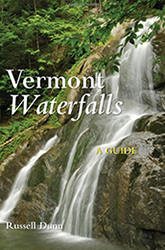 INTERESTED IN VISITING MORE WATERFALLS IN NEW ENGLAND? 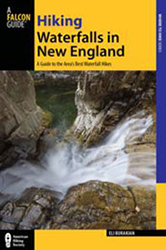 The 3rd edition of the New England Waterfalls guidebook contains 552-pages of detailed information on hundreds of waterfalls throughout all corners of New England. This 3rd edition has been completely updated and it is the first to be printed in FULL COLOR! Click on the image below to explore some sample pages of the guidebook on Amazon.com. DON'T FORGET THE ESSENTIALS - When you visit waterfalls, you should consider bringing all of the following: (a) bug spray; (b) food/snacks; (c) water/sports drinks; (d) camera/smart-phone; (e) guidebook/trail map; (f) daypack/backpack; and (g) hiking shoes, hiking boots or watershoes. A full day hiking packing list can be found here. CONSIDER BUYING WATER SHOES - You won't see too many people using them, but watershoes are fantastic pieces of equipment that can make your trip to waterfalls and swimming holes safer and more enjoyable. Merrill and Keen make some fantastic watershoes (here are some great ones from Merrill: womens / mens). LEAVE NO TRACE - When you visit waterfalls and swimming holes, you'll often see some trash and sometimes you'll even find clothing left behind by others. It's really, really sad, and it irks the heck out of us. Won't you consider carrying out some of trash and clothing left by others when you leave? That would leave the spot more beautiful for the next person. Bring a trash bag and be a hero! PRIVATE PROPERTY - Many waterfalls and swimming holes are located on private property and so we are truly fortunate that many landowners allow us to enjoy them. If you want to ensure that they stay open to the public, please do your best to leave no trace. If you see a sign that says 'Private Property', turn around and find another waterfall to visit or a different place to swim. BRING A DSLR CAMERA AND TRIPOD WITH YOU - If you want to take high-quality photographs of waterfalls, your smart-phone just won't cut it. Get a DSLR camera, a tripod, and learn to master the art of waterfall photography. SCOUT FIRST, SWIM SECOND - Never enter a swimming hole without first scouting it, even if you see somebody else swimming in it. Stop and access the risks based upon the depth of water, the power of the current, evidence of slippery rocks, and other safety factors. CLIFF JUMPING - Cliff jumping is dangerous. Like, seriously dangerous. Understand the risks before you partake in this activity. Many have died from doing this in New England. 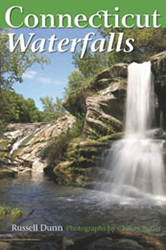 Here is a list of all known deaths at waterfalls and swimming holes in New England. PLEASE DON'T BUILD ROCK CAIRNS - Please do not build new rock cairns at waterfalls or swimming holes. Cairns are a strong reminder of human presence, and don't we all want to see waterfalls in their natural state and glory? Photographers get particularly annoyed at seeing cairns, so please resist the urge to build them. DON'T RELY ON YOUR GPS TO GET YOU TO THE TRAILHEAD - Waterfalls don't have addresses, so relying on your GPS to get you to a trailhead is great way to get yourself lost. 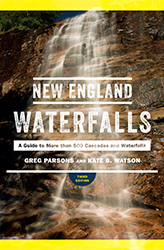 You need a guidebook, a road atlas, and/or a hiking map to visit the vast majority of waterfalls in New England. Also keep in mind that waterfalls are often located in wild areas, where smart-phone map apps and car GPS units may not work at all. WATERFALLS IN SPRING - The best time to visit waterfalls is generally in the spring during the annual snowmelt (which is April to June). However, most waterfalls will often look great for several days after a significant rain storm. HELP KEEP THE ULTRA-SECRET SWIMMING HOLES A SECRET (FOREVER) - If you find some ultra-secret swimming holes, please do your best to keep them a secret. Do not post their locations online or wildly share directions or photos with others. All of the swimming holes that are included in the guidebook and online through this website are the well-known swimming spots. There are many more holes that are much further off the beaten path, but they deserve a chance to stay wild and pristine. 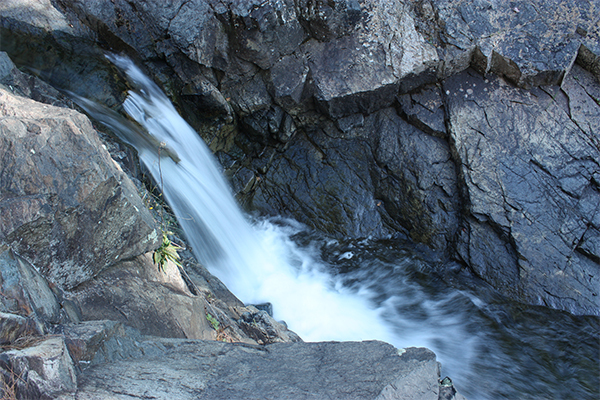 DON'T SCRAMBLE UP WATERFALLS - So many people been seriously injured and killed in the waterfalls of New England. Many of these folks got too close to a waterfall and slipped and fell. Don't become a statistic: stay far back from the edge. WEAR TRACTION IF YOU VISIT WATERFALLS IN WINTER - Visiting waterfalls in winter can be rewarding, but there is often a higher element of danger. You may need crampons, snowshoes, and/or some other form of traction (like Microspikes) in order to safely hike to waterfalls in winter. SUPPORT NON-PROFIT ORGANIZATIONS THAT CONSERVE WATERFALLS & SWIMMING HOLES - There are some organizations in New England that work diligently to conserve and maintain waterfalls and swimming holes. Please consider supporting these organizations, either with their trail maintenance projects or with monetary donations. Here are three excellent organizations engaged in this extremely important mission: the Trustees of Reservations, the Vermont River Conservancy and the Nature Conservancy. And if you'd like to follow the New England Waterfalls page on Facebook, click here. Feel free to ask a question, leave a comment, and/or provide an update relevant to this waterfall below. EXPLORE MORE OF NEW ENGLAND! Waterfalls, swimming holes, and hiking can be extremely dangerous. 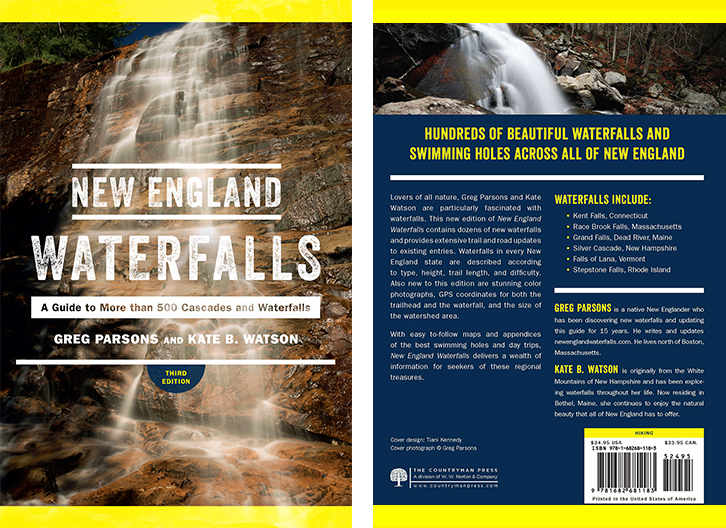 Hundreds of people have been injured or killed in the waterfalls and swimming holes of New England over the years. Never swim in strong water currents. Don't jump into a swimming hole without scouting it first. Do not climb up or along the side of waterfalls. Be weary of slippery rocks. Never swim in pools above waterfalls. Use of this website and all of its information is at your own risk! 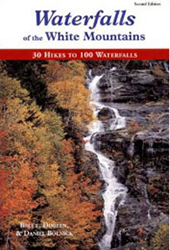 Newenglandwaterfalls.com and the authors of the New England Waterfalls guidebook will not be held liable for your actions. Be safe out there - and always use common sense!